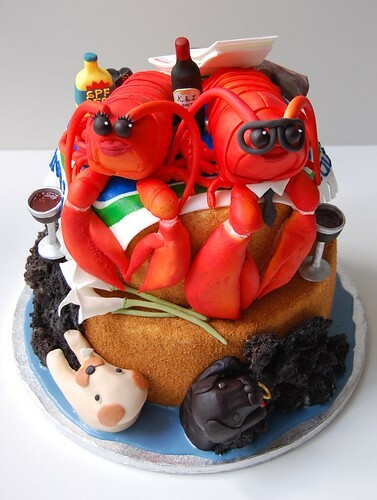 For those of you who watched Friends, you will recognize that this cake refers to Phoebe's theory that Rachel is Ross' lobster. 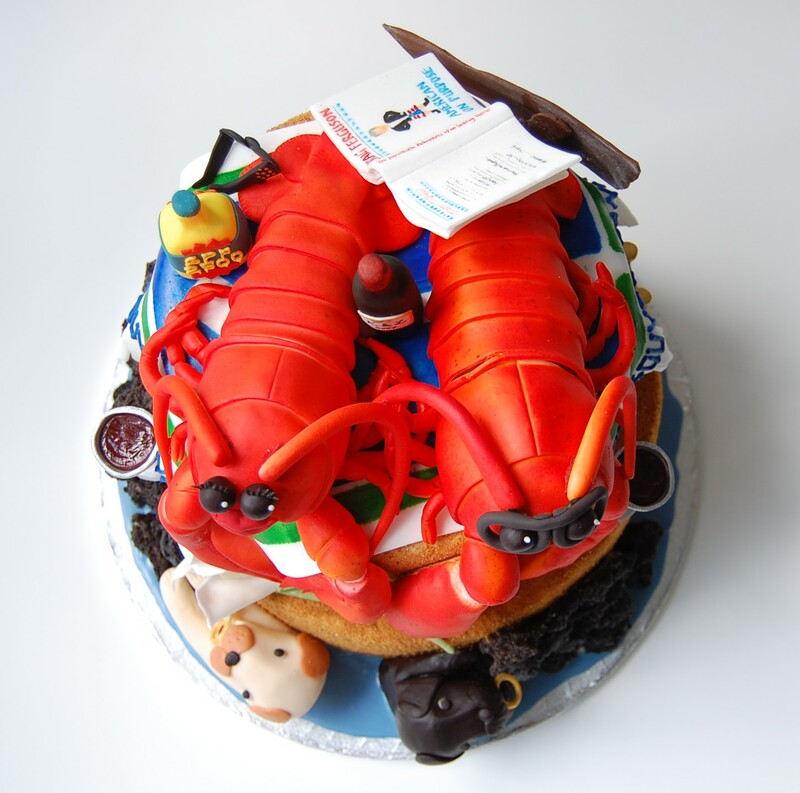 In this case, Lynn is Kelly's lobster and vice versa, and I was trusted with creating their unconventional wedding cake featuring two lobsters. Because lobsters are actually fairly ugly creatures, I had to undertake serious artistic research by purchasing, cooking, and eating a lobster myself in order to meet my rigorous standards of authenticity and realism (and yes, the lobster omelette with shallots and basil was delicious). There were 10" and 8" round tiers, each about 4" high, with lemon, white chocolate, and vanilla flavours on the bottom and mocha, chocolate, and hazelnut flavours on top. After covering with fondant, toasted leftover cake crumbs were used to create the sandy look. Black rock sugar was broken into chunks and piled up into a cliff formation. The lobster torso and front claws were Rice Krispie treats internally and covered with fondant before airbrushing to a perfect orange-red hue. This was a cake where truly, the sum was greater than its parts, although making the parts were very satisfying, especially the wine and beer bottles and Craig Ferguson book. Assembling all the parts together was the most challenging; in particular, the lobster claws were heavier than anticipated and were stubbornly refusing to defy gravity. Also, the two ringbearing dogs were originally supposed to be frolicking on the rocks, but in order to save space and maintain proper relative scale in terms of size of the objects, they both became swimming dogs! 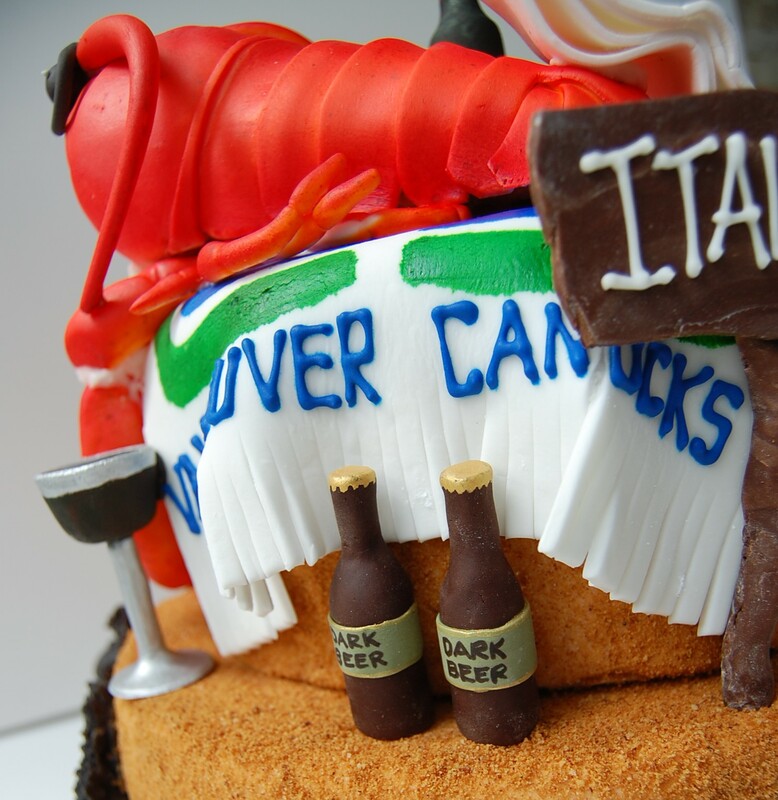 Thankfully, I did not have to deliver this cake to Furry Creek, which is a beautiful place about an hour outside Vancouver on the way to Whistler. Reportedly, the cake made it there safely and was "a big hit". And so I can let out a big sigh of relief! Congratulations Lynn & Kelly! Posted by Charmaine at 3:13 p.m. Absolutely wonderful cake! Congratulations Lynn & Kelly! June 22, 2010 at 6:17 a.m.
That is SO cute!! What a lucky couple. Amazing cake. June 22, 2010 at 12:00 p.m.
June 22, 2010 at 10:56 p.m.
June 23, 2010 at 4:03 a.m. omg!! That is the MOST amazing cake EVER! You are extremely talented! Great job! June 23, 2010 at 5:53 a.m.
June 23, 2010 at 6:42 a.m. 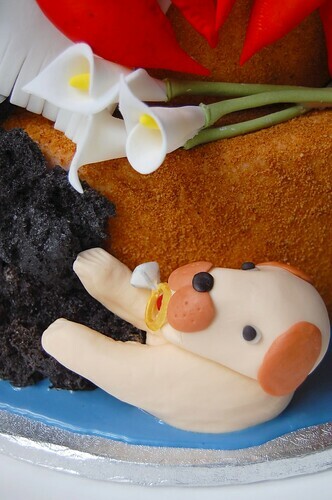 This cake is SO cute! Very well done!! June 23, 2010 at 6:58 p.m.
this is so gorgeous and amazing!!! 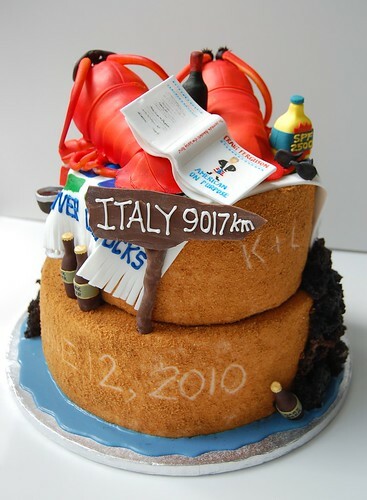 June 28, 2010 at 12:00 p.m.
this is really an amazing cake! June 30, 2010 at 12:24 p.m.
July 11, 2010 at 9:55 a.m.